Hello everyone! Today's creation is using the new Stampin' Up Awesomely Artistic stamp set. 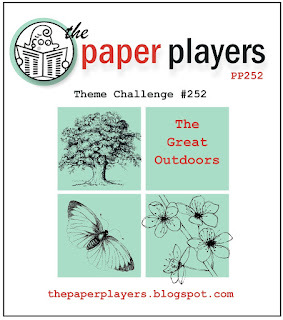 I used this set for two separate challenges - Can you Case It CYCI#77 and The Paper Players Challenge #252. I love the dragonfly! I think that the Blackberry Bliss and the Lost Lagoon compliment each other perfectly. I hope you enjoy my card! Happy Stampin'! Beautiful card! Where did you get the dragonfly punch? I love the dragon fly,too! It looks so perfect on your pretty stamped background. Thanks for sharing at The Paper Players this week...lovely card! Great way to combine both challenges, very pretty! Thanks for playing along with us at canyoucaseit.com. So pretty! Thanks for joining us at canyoucaseit.com. Love the colors and the dragonfly! Great card!! Thank you for playing with us at Can You Case It?